What is Catholic Fiction? From Tuscany Press: "Catholic fiction takes the three fundamentals of good fiction—that is, it is well-written, it tells a good story, it captures the imagination of the reader and, in addition, reflects the Catholic imagination and perspective, a Catholic theme, and a protagonist who grows to have a deeper understanding of a moral truth and God." As such, we offer here some Catholic Fiction options for your consideration... both those published by Sacrata Dei Press, as well as others we have found to have merit. Is music a universal... even Divine language? This question serves as the common thread through 'The Dominion Project', a seven book Apocalyptic series published by Sacrata Dei Press, written by the author Compasse. Though described as "a supernatural thriller with religious and political themes," Dominion defies categorization in any genre, synthesizing prophetic "revelations" from divergent sources, current geopolitical trends, and the mysterious power of music into this fictional epic that explores the very meaning of our existence. A great monument of the Islamic faith crumbles to the ground in a freak earthquake, setting the stage for mankind's entry into the next age; an apocalyptic time where right and wrong, love and indifference, and black and white fade into alternating shades of gray. Fraternal twins, Jessie and Tobias, are born to a deeply troubled Marisha Chardin under the diabolical oversight of a man, known simply as Luther, who possesses a dark presence. Though seeing the fulfillment of his own desires in young Jesse, Luther eventually orchestrates the demise of each child as a world now devoid of hope moves on. Out of the remote depths of Africa, enter into the arena a mysterious soul, Jimi T. Expo — musician, philosopher, and spiritual leader. Seemingly in a matter of weeks, this man (reverently dubbed the Mystic King) injects the world with a ray of hope — a needed dose of light. Utilizing the power of song, Jimi T. offers his message of peace, liberation, and a true heaven right here on earth to a global audience, all in preparation for our final stage of existence; the full assimilation of mankind into the Collective Soul of the universe. With the rapid decay of organized religion, and a germane response manifested in The Way of Mystic Realism — a belief system based on relative spiritualism and social truths — the world is left to ponder the question: Is this man the Christ... the promised Messiah who has come to set mankind right? Or might he indeed have a darker purpose? One man, Nathan Page, steps into center stage; facing the maelstrom through the eyes of an agnostic, but with a heart perhaps somewhere else. The scene has been set in an all-too-familiar, frighteningly contemporary time period. In the final analysis, will mankind choose good over evil? Or perhaps even worse, will he even be able to tell the difference? To whom... or what... will dominion be granted? "Gathering Storm" - Vanya Ciotola, daughter of the notorious Russian crime figure Alexandre Nesterov, has been no stranger to suffering. Following the murder of her husband and the death of their only child, human consolation proves insufficient as she struggles to pick up the pieces of her broken life. Still, amidst her interior maelstrom, Vanya is able to experience some solace in her faith—yet perhaps even more so—in the unfathomable mystery of music. When she inexplicably receives a cryptic message from her sister who had gone missing long ago, a seed is planted, and it becomes gravely clear that an affliction greater than any the world has known now gathers on the horizon. As Vanya steps forward into this transforming age, she discovers that there are darker manifestations of her one-time sources of comfort, lurking in the peripheral planes of human existence, biding their time to claim dominion. Learn more about the series at The Dominion Project. Children of the Last Days is a series of seven novels that examine the major moral and spiritual struggles of our times. 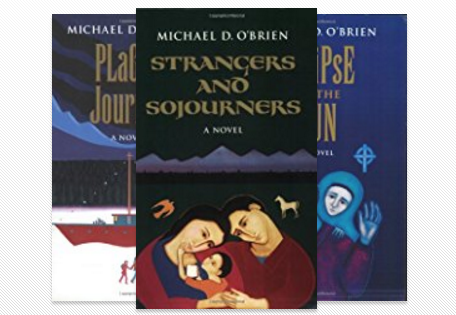 Arguably the master of contemporary Catholic fiction, O'Brien has been compared to Fyodor Dostoevsky and Leo Tolstoy as being among the greatest faith-based literary writers of all time. Each novel is rich in Catholic philosophy and thought, which is masterfully interwoven within plots, characters, and scenarios in a manner which many readers may not even recognize as being overtly "Catholic." An epic novel set in the rugged interior of British Columbia, the first volume of a trilogy which traces the lives of four generations of a family of exiles. Beginning in 1900, and concluding with the climactic events leading up to the Millennium, the series follows Anne and Stephen Delaney and their descendants as they live through the tumultuous events of this century. Anne is a highly educated Englishwoman who arrives in British Columbia at the end of the First World War. Raised in a family of spiritualists and Fabian socialists, she has fled civilization in search of adventure. She meets and eventually marries a trapper-homesteader, an Irish immigrant who is fleeing the "troubles" in his own violent past. This is a story about the gradual movement of souls from despair and unbelief to faith, hope, and love, about the psychology of perception, and about the ultimate questions of life, death and the mystery of being. In this fast-paced, reflective novel, Michael O'Brien presents the dramatic tale of a family that finds itself in the path of a totalitarian government. Set in the near future, the story describes the rise of a police state in North America in which every level of society is infected with propaganda, confusion and disinformation. Few people are equipped to recognize what is happening because the culture of the Western world has been deformed by a widespread undermining of moral absolutes. Sophia House is set in Warsaw during the Nazi occupation. Pawel Tarnowski, a bookseller, gives refuge to David Schäfer, a Jewish youth who has escaped from the ghetto, and hides him in the attic of the book shop. Throughout the winter of 1942-43, haunted by the looming threat of discovery, they discuss good and evil, sin and redemption, literature and philosophy, and their respective religious views of reality. Decades later, David becomes a convert to Catholicism, is the Carmelite priest Fr. Elijah Schäfer called by the Pope to confront the Anti-christ in Michael O'Brien's best-selling novel, Father Elijah: an Apocalypse. In this novel, Michael O'Brien explores the true meaning of poverty of spirit. Loosely based on the real lives of a number of native North Americans, A Cry of Stone is the fictional account of the life of a native artist, Rose Wâbos. Abandoned as an infant, Rose is raised by her grandmother, Oldmary Wâbos, in the remotest regions of the northern Ontario wilderness. The story covers a period from 1940 to 1973, chronicling Rose's growth to womanhood, her discovery of art, her moving out into the world of cities and sophisticated cultural circles. Above all it is the story of a soul who is granted little of human strengths and resources, yet who strives to love in all circumstances. As she searches for the ultimate meaning of her life, she changes the lives of many people whom she meets along the way. Elijah in Jerusalem,the long-awaited sequel to the acclaimed, best-selling novel Father Elijah: An Apocalypse,is the continuing story of the Catholic priest called to confront a powerful politician who could be the Antichrist foretold in the Bible. Check out more Catholic Fiction at Great Catholic Fiction. Find the Catholic Fiction you're looking for! Get your children excited about the Mass!